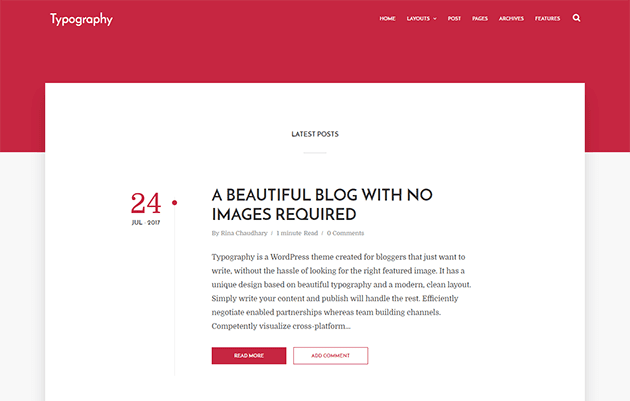 Typography is a text based Minimal Blogger Template created for bloggers that just want to write, without the hassle of looking for the right images. It has a unique design based on beautiful typography which will make your website look good with or without images. Simply write your content and publish – Typography will handle the rest. We strongly focused on the content and readability because they’re obviously important for all website owners, and, of course, the theme is very optimized for better SEO results and high-speed guaranteed. We wrote a very detail and clear guide to help you easy work with Typography - Text Based Minimal Blogger Template. But if you have any questions, please feel free to ask on our comment system, we’ll answer your questions immediately if you have same GMT with me (GMT +5.30).